Expanding agrarian and indigenous strikes hit at least half of Colombia’s 32 provinces Tuesday. Ignoring government warnings, protesters blocked important roads and even retained four soldiers. The farmers and indigenous protesters demand the government keep its word on promises made in 2013 to end a similar national strike that left dozens dead. The protests began Monday and immediately escalated just outside Buenaventura, Colombia’s main port city, where a man died and protesters attacked trucks, effectively blocking the main road connecting the port city with the rest of the country. Mantilla’s organization, the National Rural, Agrarian, Ethnic and Social Minga claimed that some 70,000 people are participating on more than 100 locations in 27 provinces because “the government has failed in developing the agenda for discussion on agricultural policy. Police gave considerably lower estimates of the protest’s prevalence, claiming there were protests on 23 locations in 20 municipalities where some 4,600 people are mobilized. The Prosecutor General’s Office estimated some 10,000 had mobilized. Peasants protests were confirmed in the provinces of Cauca, Antioquia, Boyaca, Casanare, Caqueta, Cesar, Choco, Cundinamarca, Huila, Meta, Nariño, Quindio , Risaralda, Santander, Norte de Santander and Valle del Cauca. Apart from Buenaventura, authorities reported several roadblocks on the Pan-American highway between Cali and Popayan, near the city of Yopal. Tumaco, the second largest port city on the Pacific coast, was also disconnected from the rest of the country after protesters blocked the road there too. In Antioquia, four soldiers were briefly held hostage by protesters, but had returned to province capital Medellin by the end of the day. Colombia’s government have spoken out strongly about the manner in which the strikes are being carried out and warned Colombia’s feared riot police will break up any roadblocks. “The government respects the protest and we will give them all the guarantees, but it can not affect the rights of those who are not protesting, In other words, roadblocks are not allowed by the law,” said Iragorri. The latest strike is calling on the Santos administration to deliver on the promises made following a strike in 2013 which saw 12 protesters killed, nearly 500 wounded and 600 detained, according to reports. The strikes were spurred by an agricultural crisis following decades of admitted government neglect of Colombia’s rural economy problems which protesters claim Santos has done nothing to solve. 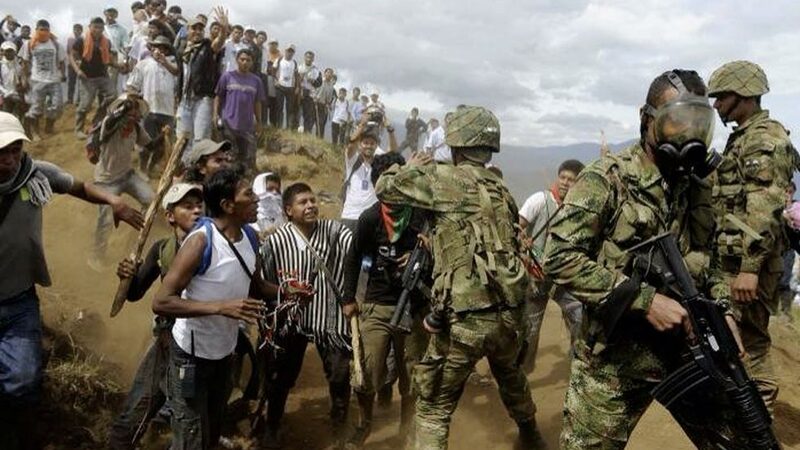 As tensions increased across the country, national indigenous organization ONIC denounced the use of excessive force by riot police, known as ESMAD, whom they accuse of using violence to repress the peaceful demonstrations. Indigenous groups have requested the immediate presence of the United Nations and the Red Cross to guarantee the right to protest is respected.